This handsome black gelding is by Brass and out of the Saddlebred mare Glamorize. 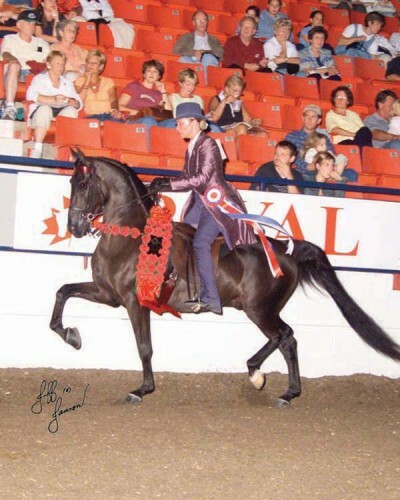 Born in 1999, he quickly took to the show ring, capturing his first national championship title at the 2003 Canadian National Championships in the Half-Arabian Country English Pleasure Adult Amateur Owner to Ride 18-39 class. He earned a Top Ten in the Junior Horse class that same year. Brass Glamor Shot returned to Canada the following year, earning Top Ten awards in both those same classes. At the 2004 U.S. Nationals, he was Champion Half-Arabian Country English Pleasure Junior horse, besting a field of 44. He continued his winning ways, with multiple Scottsdale and regional successes. In 2007, he was Reserve National Champion at the U.S. Nationals in the Half-Arabian Country English Pleasure open. In 2008, in a hotly contested class of 60 at Youth Nationals, he brought home the Reserve Champion garland in the Half-Arabian Country English Pleasure Junior to Ride 14 – 17 class.